Our expertise in a wide variety of industries benefits all our clients. Because of our diversity of clientele, we are able to work with the majority of metal types from Aluminum and Stainless/Carbon Steels to Alloys like Titanium and Monel. 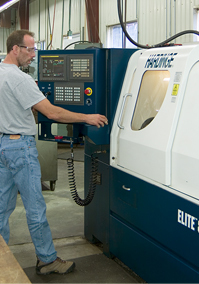 We can also work with most machinable plastics and ceramics. • Production of unique sub-assemblies for manufacturing & engineering fixtures and equipment.